Whether you have fulfilled 2018 resolutions or not, you deserve to treat yourself to top-notch nosh. 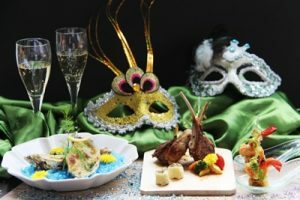 Spend the penultimate day of the year at Cinnamon Coffee House this New Year’s Eve, where a spread of delectable highlights for dinner melds into a countdown bash. Expect to be stunned and satiated with specially curated celebratory foods. Highlights like the Chicken Roulade with Cranberry Jam and Rosemary Sauce, Baked Oyster with Coriander, Butter and Cheese, Salmon with Sautéed Fennel, Leek and Horseradish Sauce, Stir Fried Jumbo Bamboo Clams ‘Kam Heong’ Style, Wok Fried Tiger Prawn with Spicy Pineapple Sauce and Oxtail Rendang are just some picks that steal the spotlight. With a lavish selection of exquisite sweet treats such as Buttermilk Panna Cotta, Lemon Praline Cheese Cake, Black Forest Eclairs, Mango and Cinnamon Petite Gateau, Green tea and Strawberry Entremets, Lime Meringue Tartlet, Apple Raisin Pie, Assorted Nyonya treats, Chilled Soy Bean with Lotus Seed and Red Bean Porridge, it would definitely be a night to remember! Apart from the mentioned, a variety of local specialties and international favourites are also featured in the extensive spread. Well suited to business lunches, team dinners or private parties, Cinnamon Coffee House accommodates up to 350 guests. Making a prior reservation for our restaurant to avoid disappointment is strongly recommended. Please call 603 – 7681 1157 or email us at cinnamon@oneworldhotel.com.my for further assistance or enquiries such as discount or promotions.